The NodeIT by Sweet Pea’s is an extendable, minimal IoT thing being launched on kickstarter right now. The project has already been funded, but is still open to additional backers. In addition to these boards, the Workstation40 boards adds 8 ADC channels, 8 GPIO pins and 6 PWM/timer/counter pins. 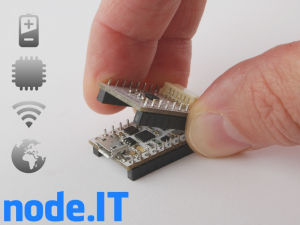 This board breaks the form factor to fit all the pins, but the NodeIT is still stackable when connected. All boards communicate over an I2C bus, reducing the number of pins used up for this purpose at the cost of limiting the bandwidth. However, given the purpose of the NodeIT, the I2C bus is probably not a problem. The system comes with an IDE based on the Arduino IDE. This might not be the prettiest IDE around, but it works. Additional software for the NodeIT can be found on the project’s github page. This entry was posted in Electronics, IoT, Platforms, Programming. Bookmark the permalink.